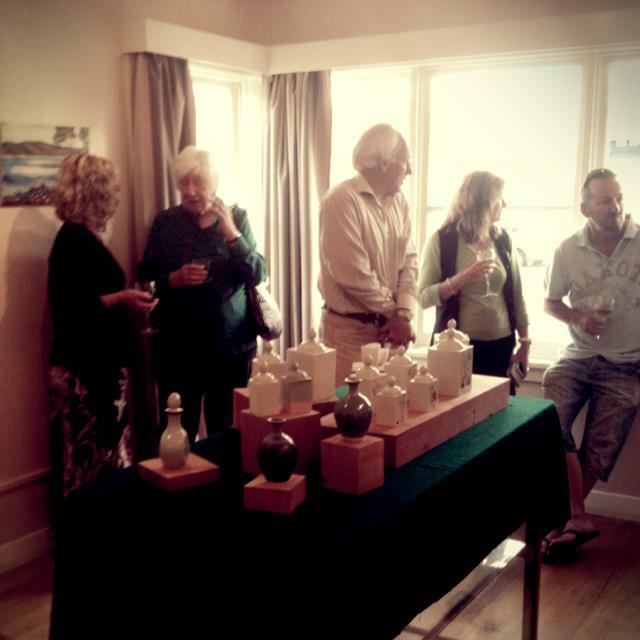 A fantastic opening was had celebrating the works of these lovely local artists. 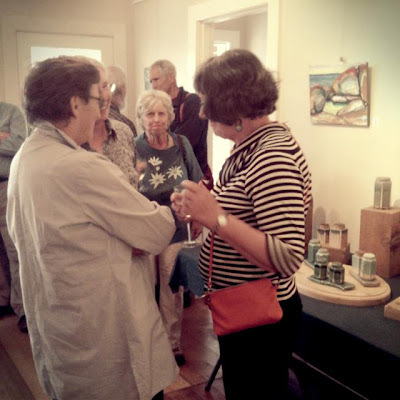 The art center was busting at the seams with a crowd and an energy that was outstanding. 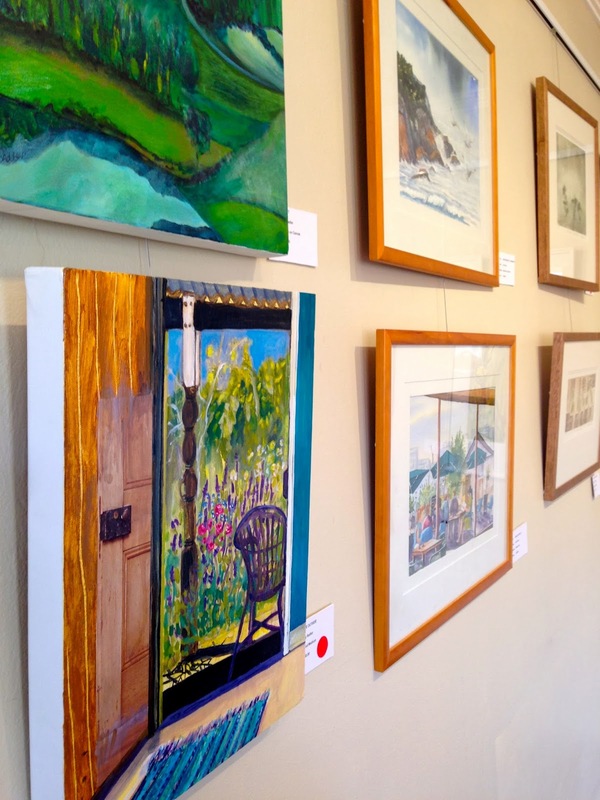 It was lovely to see this beautiful collection of local artists displaying their beautiful works and being supported by so many of the locals. A big thankyou to the artists and the hard work that was put into the opening, the art work that is exhibited and the people that turned up and showed their support for local talent. 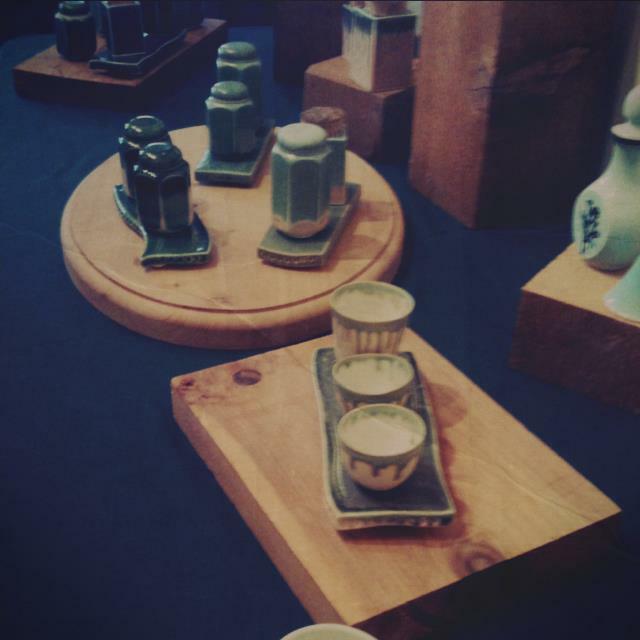 You can view this exhibition till the 12th of December on Tuesdays - Saturdays from 10am till 2pm. Wynyard’s Tulip Festival is happening this Saturday 12th October 2013. This is a fantastic local festival featuring the many colours of the tulips and the town locals. In the Artscape building we will be hosting another great Made with Love Market from 9 – 1 pm - full of fantastic handmade and artisian goods and fresh produce from our farmers. 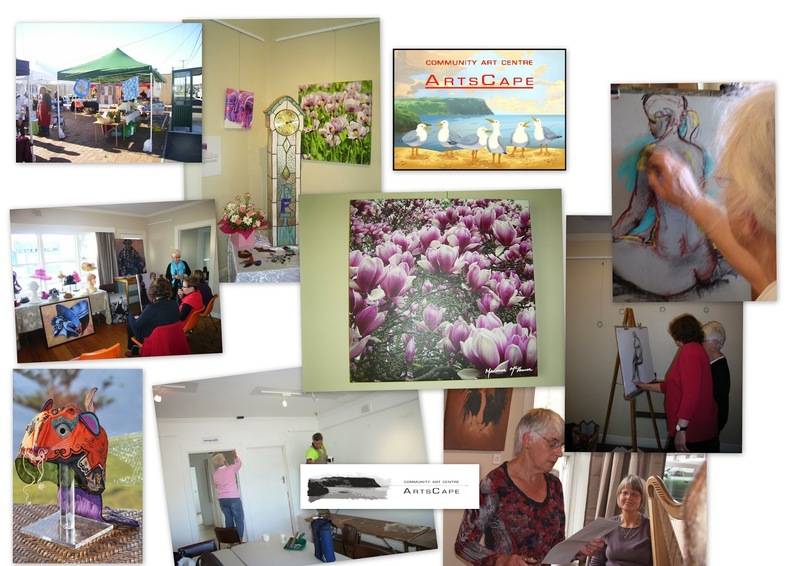 You can also find Artscape representing and all day at Stand 59, Gutteridge Gardens, Wynyard. Our volunteers have put together a lovely display about Artscape and are very happy to talk to you about our programs and ideals. 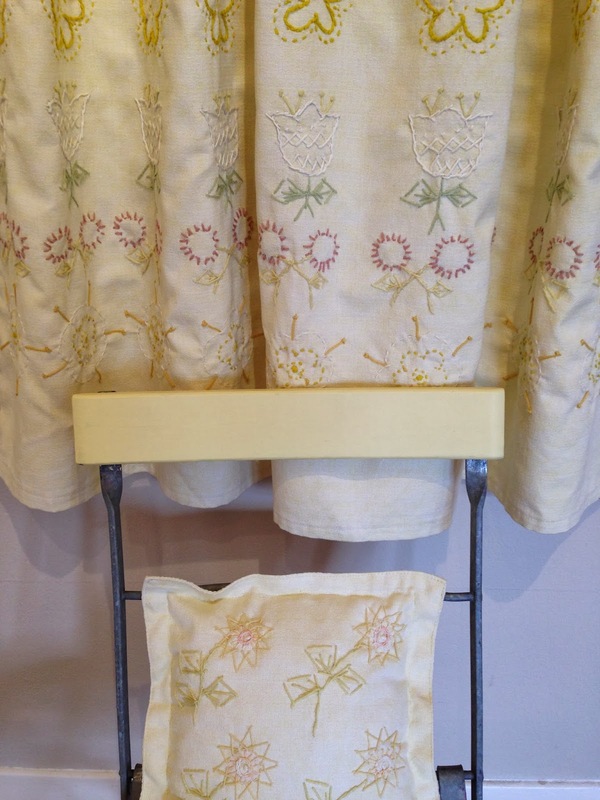 Do pop in and visit us. 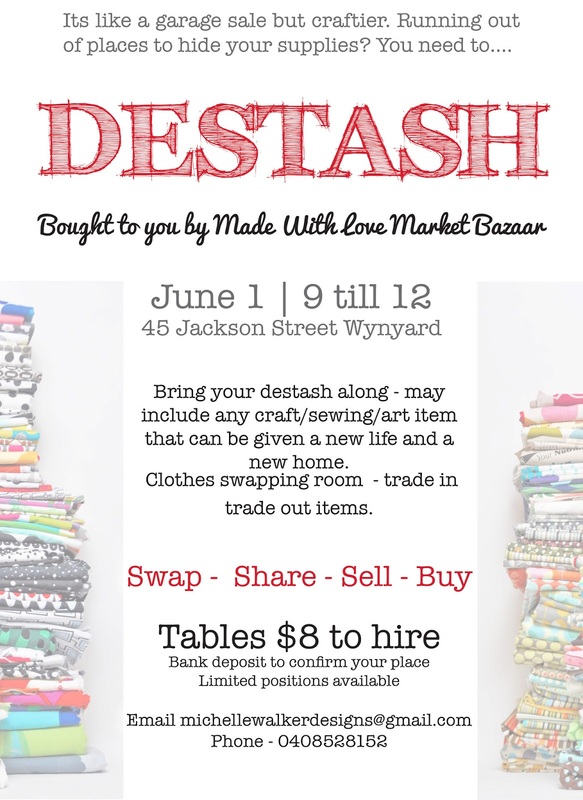 Lots of other events happening in Wynyard that day, pick up a map or talk to us at the Market or on the Stall. 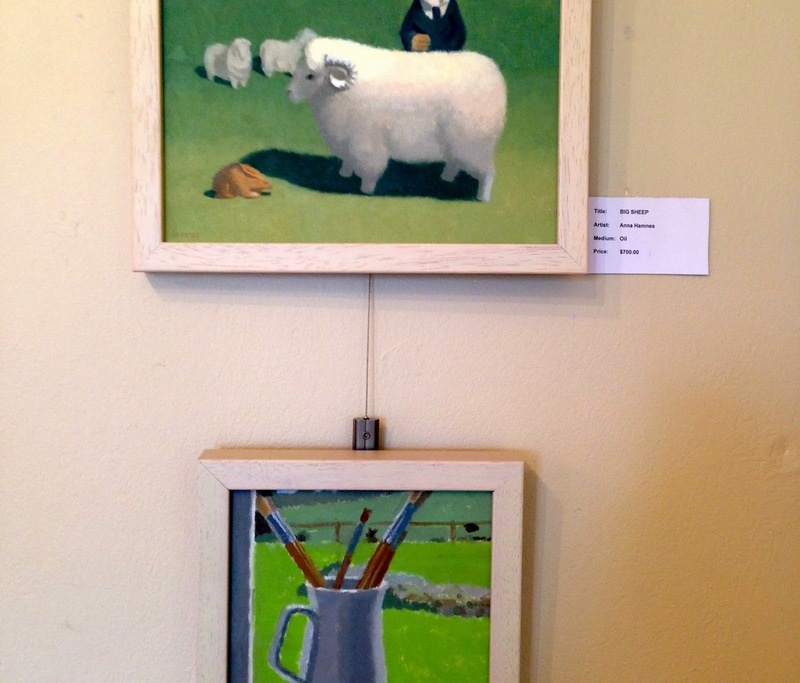 Doris’ exhibition continues for the rest of this week, 10 – 2 pm. She has been getting some fantastic feed back so make sure you pop into view this great local exhibition before it disappears. Opening Reception at 6 pm on Friday 20th September. Details to follow. 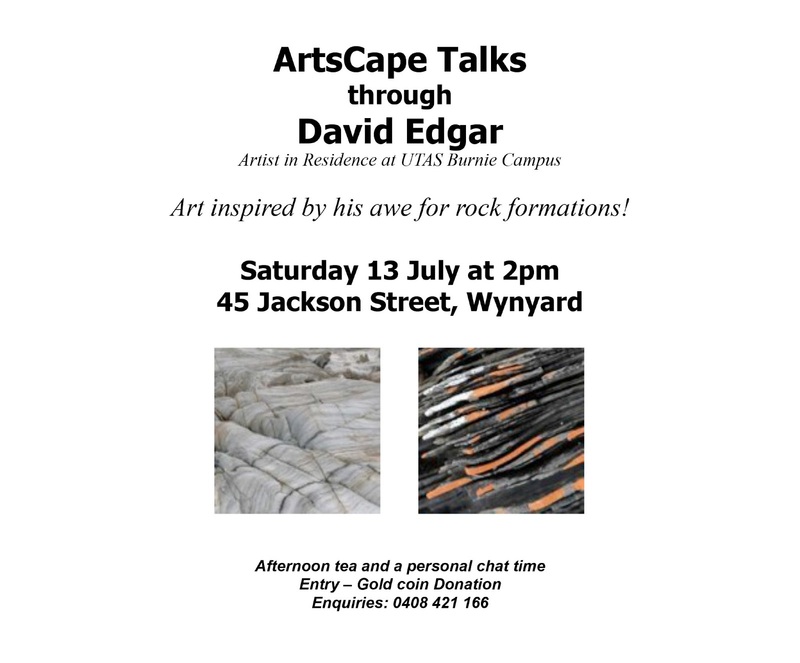 Please spread the word about the special ArtsCape Talk on Saturday 13th July at 2 pm with David Edgar. Currently David is completing an Artist in Residency at University of Tasmania and is very generously coming over to Artscape this Saturday to give a great talk and presentation about his work. 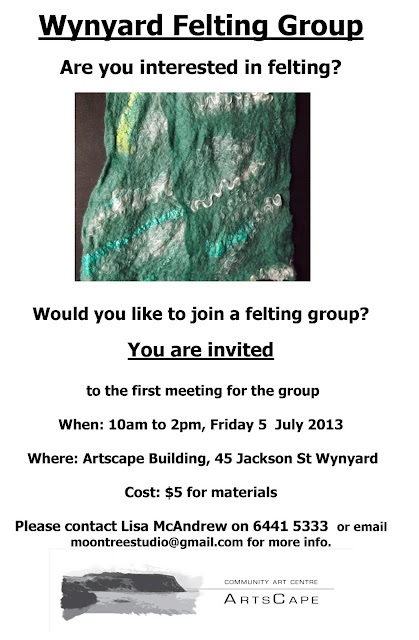 We have a brand new group starting up at ArtsCape. What fantastic news for all our felters in the region. If you are interested in felting or learning to felt then please pop along. Details in the above poster. 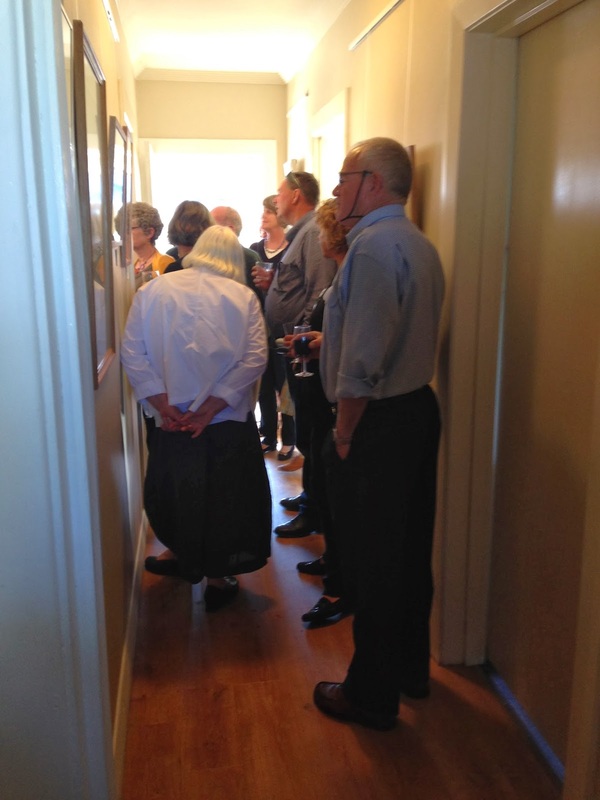 Don't forget that ArtsCape is here for the community as a whole and if you would like to have your own exhibition or start an interest group then please contact us. We are always ready and willing to help you start your arts adventures and support you in a regional environment. Take that first step - you never know where the path will lead. We are very pleased to bring to you these two events. 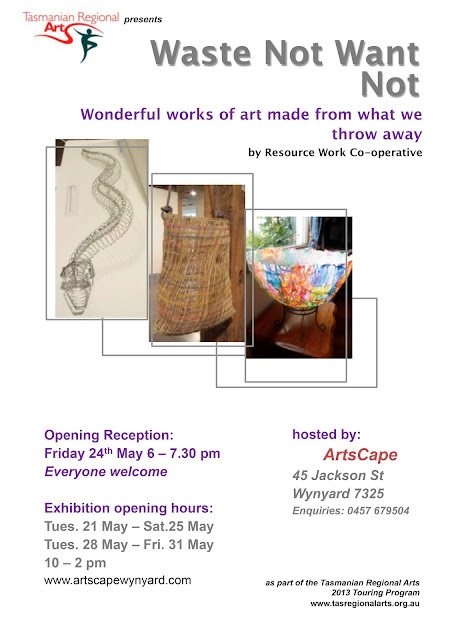 Firstly our new exhibition "Waste not want not" - a touring exhibition from Tasmanian Regional Arts - opening this Friday night. Secondly our "Destashing" Event - like a garage sale but craftier. Destash all those unused craft - art - sewing items that you no longer need. More information on the posters. This exhibition is opening tomorrow. We are not hosting an official opening night so be sure to pop into ArtsCape in the next two weeks to view this amazing exhibition and its stories. This blogging for beginners workshop where the focus will on branding and marketing (arts branding and marketing in particular), developing a first blog and basic instruction for tackling social media. 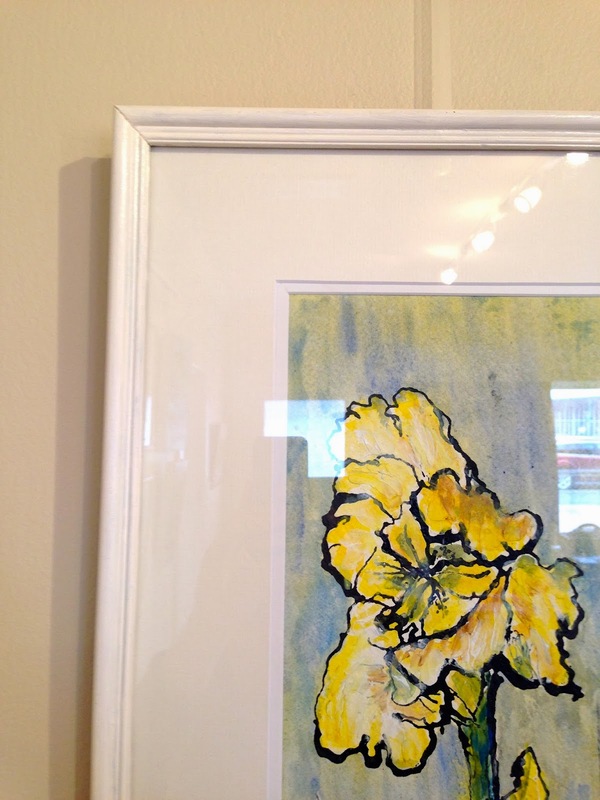 Living as an artist in our regional location makes it very important to get yourself out there as much as possible. Take the fear away from people and empower themselves to really make a go out of their craft. 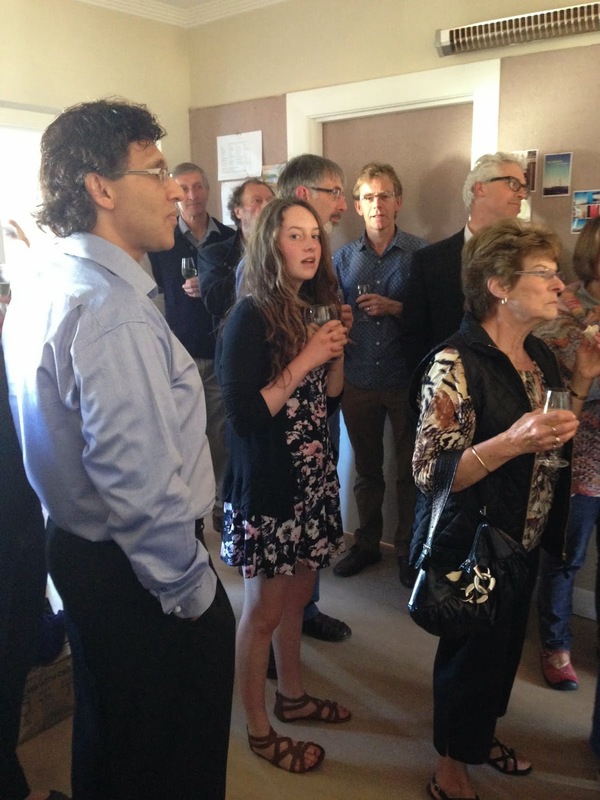 Especially when events like this happen to the makers of our region. This happened without any public consultation and will devastating for our arts community. It is not simply good enough to sit there and take it - to mope around waiting to be discovered. People must be pro-active in their marketing. It is not selling out. To continually work for free as an artist and not be active in your personal development is a down right idiotic approach - revolution of your personal image, time and space is a must. This workshop is focussed on those at the beginning of their marketing and branding. Those more advanced in blogging would not get as much out of it. 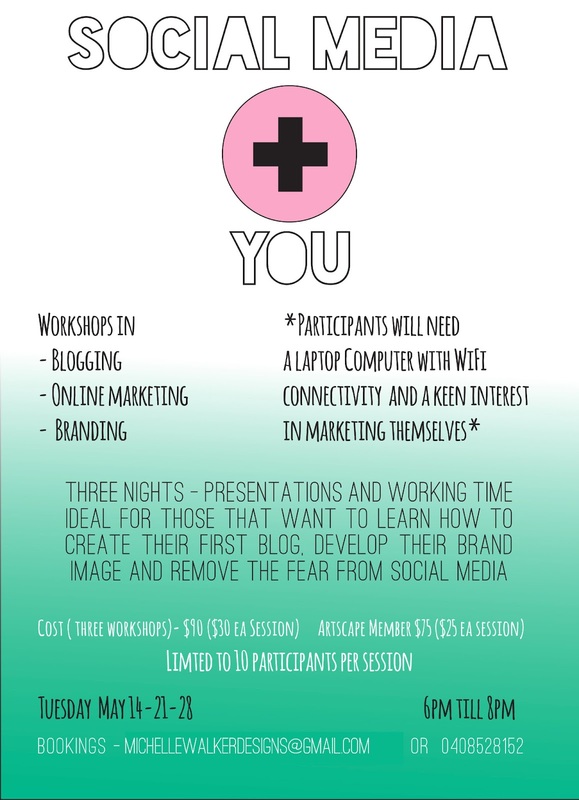 This workshop will take the fear out of peoples first attempts into social media and hopefully they can continue to advance from there. It will be a solid foundation to grow from. So till next time - what challenges do you face in your location that can be overcome through blogging? I'd be interested to know. We’ve been very fortunate in attracting Lyn Smith to lead our singing group at ArtsCape. Lyn was on the production team of the recent highly acclaimed and wonderful production of Les Mis by Burnie Musical Society. Lyn is open to suggestions on the type of music we want to try and with her wide experience of all types of singing is bound to find something that will bring out the best in us! A fun way to start singing or gain confidence to sing somewhere other than in the shower! The workshop will be run by Lyn Smith, well known in NW for her many musical talents. She will introduce us to a diverse mix of simple songs, rhythms, improvisations and a little gospel singing! Only $5. for this introductory session. On Saturday we are hosting another "ArtsCape Talk". 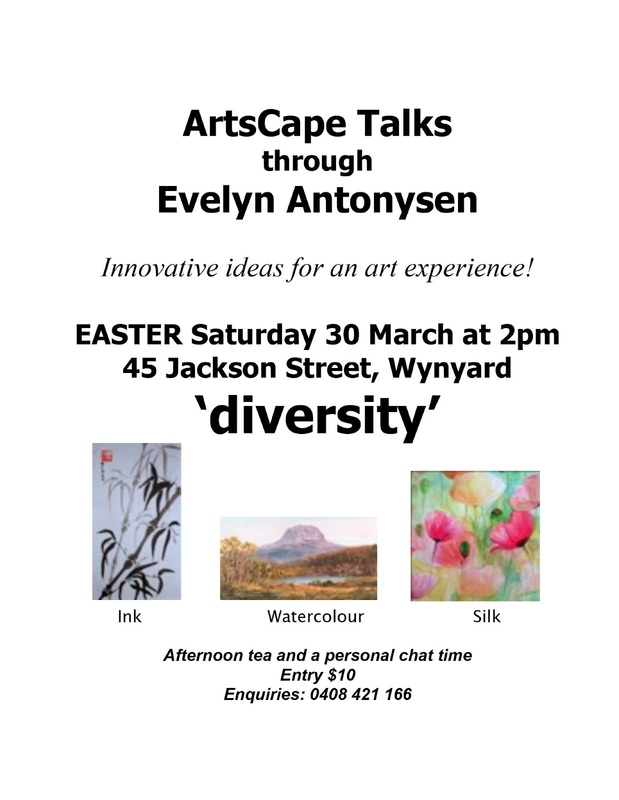 Come and listen to Evelyn Antonysen and get your Easter arty fix. 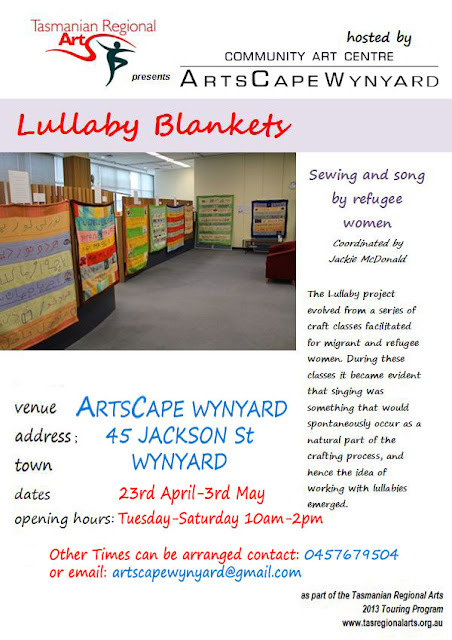 In April we are hosting another exhibition from Tasmanian Regional Arts entitled "Lullaby Blankets" More destails to come shortly. 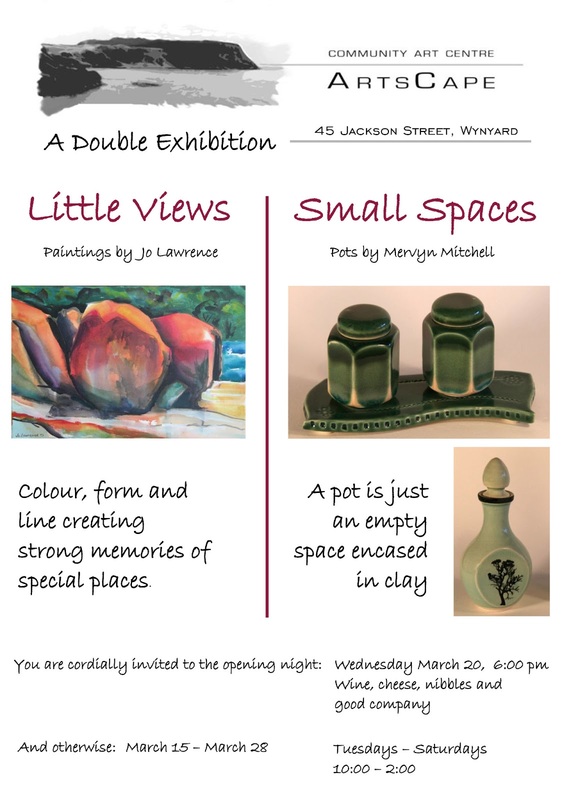 We have a wonderful double exhibition starting on Friday 16th March â€“ Jo Lawrence's "Little Views" very vibrant paintings which compliment Mervyn Mitchell's "Small Spaces" ceramic pots in all sorts of lovely designs. 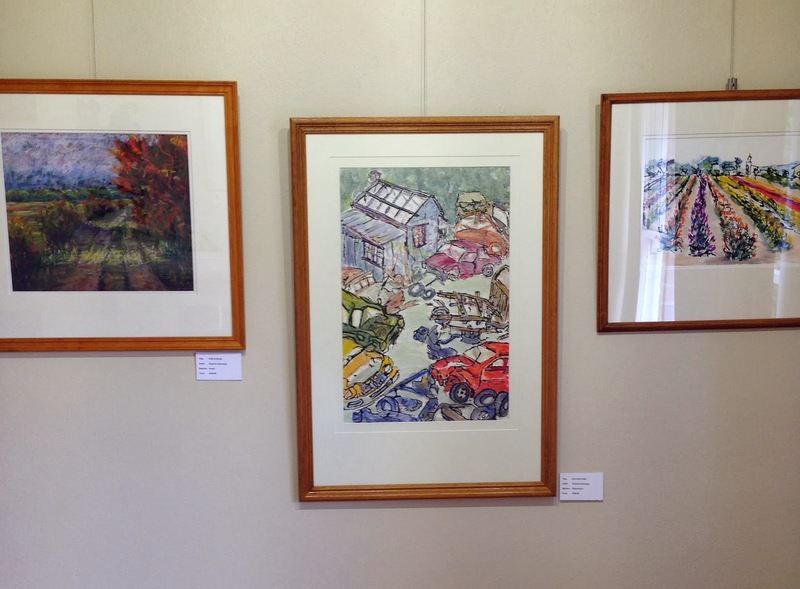 The exhibition will be open from 10 - 2 pm on Friday and Saturday, and then Tuesday to Saturday the following 2 weeks. 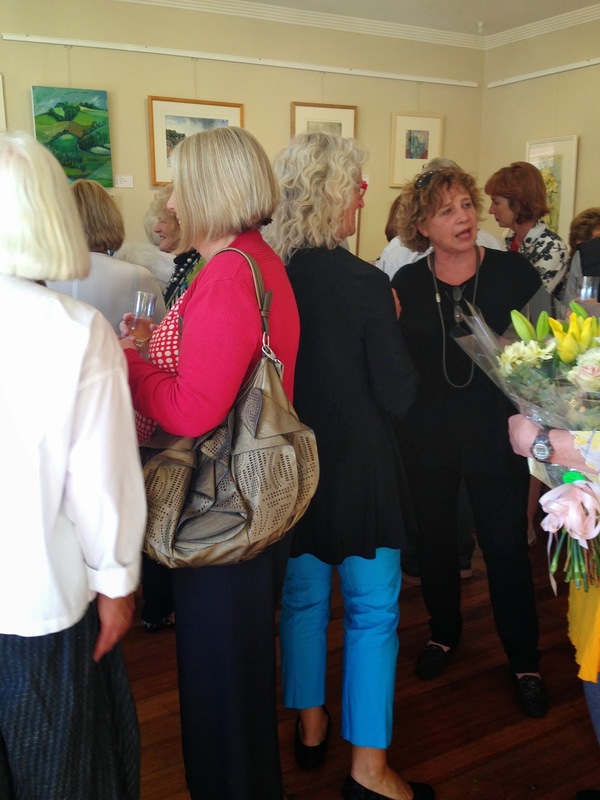 The Opening Reception was held a at 6 pm on 20th March - we had a fantastic crowd and would love to thank everyone that came and supported our lovely local artists. Many of you will remember Sarge's very successful first exhibition at ArtsCape over a year ago and have seen his paintings in various venue's since then. He is now preparing some more work and requires space so will be using the backroom at ArtsCape during the week following Easter. This should not cause any problems for other users but please respect any material he leaves out during this period. Finally, just another gentle reminder to those who haven't yet renewed their membership, or to anyone wishing to join just let me know and I'll be delighted to send you the details! We have some new things for you to enjoy...firstly we have a new facebook page. Here will have links back to this website but also quick updates on coming activities. 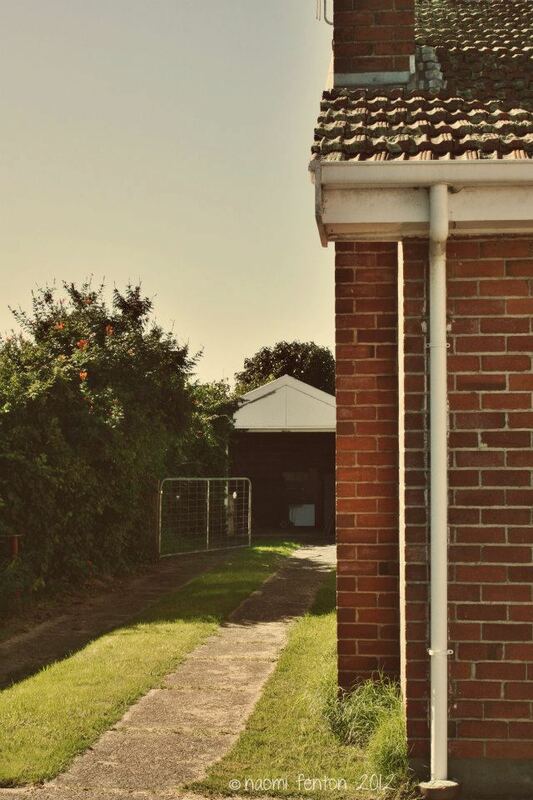 Click HERE to be taken over for a look. We also have two new contact points. Our official artscape email is now artscapewynyard (at) gmail (dot) com. This will take the email away from any of our personal accounts and be the one "go to" address for our written communication. We are also back on a phone line - one of our friendly committee memebrs can now take your enquiries on 0457679504. Oh it's all so exciting!!! Congratulations to Marie Leicester who is our new President for 2013! Welcome back to Michelle Walker who took a break last year but returns to represent the monthly Market and inspire us with her creative flair. Also joining the committee is Margaret McMahon who has been a member for many years and will replace Judy Taylor as she takes a well earned break. The rest of the committee, including past President Alwyn, remain the same and will continue to plan and organise an exciting range of activities in 2013. Thanks to all those who attended the AGM. We are putting together a programme of events for 2013 which will include exhibitions, talks and workshops. If you would like to be involved and help us to create a really vibrant arts centre please come along to the AGM. We plan a short meeting and then time to socialise over a glass of wine! Happy New Year to all our members and welcome to visitors who may like to join us. We are putting together a programme of events for 2013 which will include exhibitions, talks and workshops. Watch this space! Please come and make your wishes known, whether its to vote on Committee members, review of membership fees or future exhibitions, workshops and events. Nomination Forms available from President or Secretary.